Former England captain Michael Vaughan will offer his proposal for an FA Cup-style Twenty20 competition to the England and Wales Cricket Board. The idea of a knockout involving first-class sides, minor counties and clubs came in response to an ECB report into falling numbers in amateur cricket. "I'm trying to set the ball in motion for the game of cricket to realise that we need change," said Vaughan. "The whole game needs to gel together and this is one way." An ECB survey published last week showed that the number of people playing cricket in teams at grassroots level fell from 908,000 in 2013 to 844,000 in 2014 - a drop of 7%. "The game's administrators should be concerned about those participation figures," Vaughan told BBC Radio 5 live. "Cricket needs to get a buzz back into it. "A lot of my friends play semi-pro football and all they ever talk about is the FA Cup." 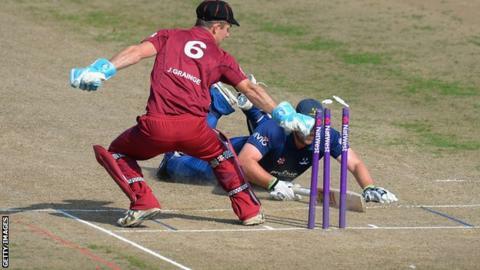 The T20 knockout could involve the 18 first-class counties, 20 minor counties and clubs from the 26 ECB Premier Leagues - the top level of amateur cricket. Like the FA Cup, the club sides would be involved in the early rounds, with the minor and first-class counties entering at a later stage. "You want that romantic tie, that opportunity for a club side," added Vaughan, who captained England in 51 Test matches between 2003 and 2008. "It's something that could be set up quite easily. It will get the amateur game closer to the professional game, get pros who aren't in their county side back into the club system and a way of getting some cash back to the grassroots. "It wouldn't add too much more cricket to the first-class sides because they might only need to play four matches to reach the final."